The outgoing Acting Secretary General of People’s Progressive Party (PPP) Omar Amadou Jallow alias OJ has said that the PPP Party will use the court to recover their stolen and seized properties. “I have already addressed a letter to the Justice Minister seeking for the immediate return of our seized properties” under the leadership of the former exile Gambian dictator Yahya Jammeh; he remarked. He made these revelations during the national congress at YMCA in Kanifing along the MDI road. It could be recall that the PPP Party was been banned following the military coup in 1994; this was followed with confiscation of the party’s properties including that of the minister’s compound’s with any due process of the law by the former regime. 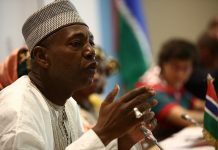 “The military junta of Yahya Jammeh embarked on a systematic campaign of lies in an attempt to vilify our party and discredit its development”; he alleged. He revealed that 1996 Yahya Jammeh banned both the PPP Party NCP and GPP and the then leadership seized all their assets (Buildings; vehicles) and in addition burnt the PPP archives. Adding that the Brikama Annex formally called the PPP house and the Gambia Immigration Department all belong to the PPP Party. He concluded by thanking the Gambian diaspora who had played in the previous years in supporting the party hoping for the continuously relationship for the benefit of the party and the country at large.